Praised by the Strings Magazine for possessing a sound “with probing quality that is supple and airborne” and for her “pure, pellucid bow strokes”, violinist Keiko Tokunaga spends most of her days touring and performing globally as a soloist and chamber musician.A passionate advocate of the chamber music of all eras, Ms. Tokunaga joined the internationally acclaimed Attacca Quartet in 2005. She has soloed with orchestras including the Spanish National Orchestra, Cabrillo Festival Orchestra, Amherst Symphony Orchestra and Hilton Head Symphony Orchestra. She has appeared in such major venues as Weill Recital Hall at Carnegie Hall, Alice Tully Hall, the Metropolitan Museum of Art, the Rubin Museum, the Museum of Modern Art in New York City, the Banff Centre in Canada, Ohji Hall and Suntory Hall in Tokyo, and Izumi Hall in Osaka. Ms. Tokunaga released her debut solo album, “Jewels,” from New York Classics in 2016. When she is not touring with the quartet, Ms. Tokunaga enjoys her career as an educator. She has been on faculty at The Juilliard School’s Pre-College Ear Training Division since 2008, and she recently served as a violin instructor at the Fordham University. 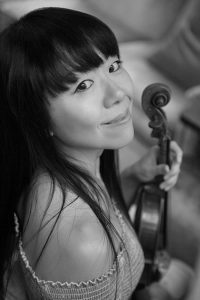 Ms. Tokunaga’s private violin students range from absolute beginners to winners of international competitions, and she welcomes students from all ethnic and cultural background. Ms. Tokunaga holds an Artist Diploma, a Masters and a Bachelor of Music from The Juilliard School. She plays on Stefano Scarampella violin from 1900.